VINTAGE FRENCH INSPIRED WHITEWASHED CABINET WITH GLASS DOORS . VERY PRETTY CABINET FOR KITCHEN OR LONGE WITH TWO DRAWERS SHELVES BEHIND GLASS PANED DOORS HAS GOT ORIGINAL KEY ONE PANE OF GLASS TO FRONT LEFT DOOR IS CRACKED BUT ITS AN EASY REPLACEMENT TO MAKE IN LIME WASH WITH POWDER BLUE DETAILING HAS SOME AGE BUT NOT ANTIQUE IN GOOD SOUND CONDITION. SMOKE FREE HOME ,NO WOODWORM. COULD EASILY BE REPAINTED. SEE PHOTOS MEASURES 38” ACROSS TOP OF CORNICE 68” TALL AND 16.5” DEEP TO CORNICE PICK UP ONLY UNLESS YOU ARRANGE COURIER. COURIER MUST WRAP ITEM THEMSELVES. PICK UP FROM TA78LA 10 MINS FROM JUNC 23 M5 LEVEL LOADING. Hello and welcome to my auction for a very rare Vintage/Antique Glass Cabinet. You really do not see something like this everyday and this is your chance to own a fantastic piece of furniture which will serve you well for many many years to come! It is in fantastic condition! Any questions please do not hesitate to contact me! Happy Bidding! Antique/ vintage, Victorian mahoghan, bevelled glass door cabinet. Mahogany, small cabinet, I think originally part of a larger Victorian cabinet. Original velvet covered shelf inside. Interesting carved work on legs and front. Lovely glass doors. Measures height 40 1/2" , depth at sides 17" depth at top 19 1/2" and width is 28"Please study photos carefully. Would benefit from some restoration. New listingChina Cabinet 1930's Glass front and sides. 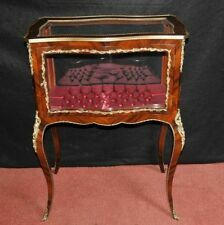 ANTIQUE GLASS DISPLAY CABINET WITH AND KEY . MIRROR BACK. 2 GLASS SHELVES. DOOR IS SLIGHTLY OUT. SO NEEDS ADJUSTING. BACK PANEL HAS BEEN REPLACED WITH HARDBOARD. USUAL AGE RELATED MARKS AND SCRATCHES, BUT OVERALL GOOD CONDITION. PLEASE SEE PHOTOS. COLLECTION ONLY. Ebonised with gilded lid which has worn. There is no fastener, it just has a hook and eye type screw which has obviously been adapted to secure the lid but isn't really necessary. Green baize lining which is clean but not a perfect fit so might need replacing. The cabinet is lockable and has 3 shelfs. This is a great one off item. Curved Art Deco style. Locking, with key. Six-panel glass front & sides. 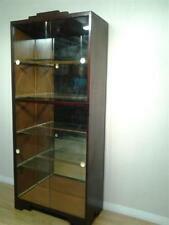 Two intact glass shelves. The cabinet has a lovely round finials and has a lovely decorative thin lighter line surround. The back of the cabinet is slightly warped but again this does not distract from the item when displayed. BEAUTIFUL CIRCA 1960's DISPLAY CABINET. TWO PIECE CABINET MADE AROUND 1960's WITH. IT IS A LOVELY PIECE AND WOULD SUITE MOST ROOMS IN THE RIGHT HOUSE. STORAGE CUPBOARDS AND ORIGINAL GLASS SHELVING. FROM THE CENTER BOTTOM DOOR. Vintage Glass Display Cabinet. Condition is Seller refurbished. This has been hand painted in black and has two glass shelves to display all your treasures. All three front panels are glass and there is a panel at the back of the cabinet which is black. Collection Watford or I can arrange a quote for delivery. I prefer cash on collection please. Antique glass cabinet that has only stored glasses in. Approx 70 yes old. May need a bit of TLC but nothing major. Vintage Display Cabinet Denmore Glass Shelves Delivery Available. Vintage Retro 50s Cocktail Bar Drinks Cabinet /sideboard/writing desk. Collection in person only. In excellent condition. Vintage Antique Large Glass Cupboard Cabinet. Collection in person only. Antique wooden, glass fronted, with interior lights, pre World War 1, . A vintage glass display cabinet that has been in the family for 50 years. Some wear and tear (see photos). Collection only from Morecambe, cash on collection. Good functional condition with working lock and one key. Glazed on five sides. Original 1950s Stunning Art Deco Glass Display Cabinet. Beautiful item standing at approx 49 inches tall. It is a lush piece stunning shape. It has some cracks to the glass plz see images I will deliver local or collection from Trelewis South Wales. Lovely cabinet with 2 glass shelves (removable safety glass) and a working lock and original art deco design on the glass. There are a couple of small cracks in the glass on two of the side panels (see photos). The fantastic colours along with the stepped plinth top and pretty carved front feet give this cabinet a graceful appearance. We do not have they key for this piece but the pretty door handle turns a door latch so that it can be open/shut properly. Beautifully cleaned and reconditioned. The Cadburys lettering a more recent addition. Curved glass front which lifts to reveal an interior with a single glass shelf and mirror back. The glass shelf is 25.5cm deep. Dating from circa 1930, this substantial kitchen larder is constructed from solid pine. It has two upper glazed cupboards over central etched glass fruit bowl motif with further cabinets and drawers beneath, each with stylish aluminium handle. The mirrored column flanked by sliding glazed doors enclosed mirrored interior and removable glass shelving. An impressive mid 20th century glazed cabinet. Width: 120.9 cm Depth: 33.9 cm. Its rare to find one with the front of the cabinet having leaded glass which again adds to the beauty of it. It stands well on elegant slim legs. There is no key but the door has a lovely little handle for opening and closing and it does stay shut. Here's a stunning display cabinet (Edwardian I believe) in excellent condition. The key does lock the main glass door as well as the top lower drawer. There is another hidden drawer below the keyholed drawer. Matching Antique glass cabinet to the dining table i am selling. As you can see in new condition hardly used. I need storage space unfortunately and need to sell the items which i really love as they look elegant in a dining area etc. Open to offers please message me. Collection only. The sliding glazed doors enclosed a button back upholstered interior with glass shelving and base. An impressive and rare form mid 20th century glazed cabinet. Width: 70.6 cm Depth: 39 cm. Beautiful antique shop display cabinet with very heavy milk glass to the base for keeping items cool. As seen, i have used it for jewellery display but it is so useful for home or shop display. Will be sad to part with it. :( Can be viewed in Topsham Quay Antiques. Vintage Antique Large Green Painted Larder Cupboard Cabinet Wardrobe. Could easily be converted into a larder or kitchen cupboard by removing the internal shelves. the green is a lovely colour. 222cm Tall. The cabinet is near triangular in shape and has been designed to fit into the corner of room. It has been constructed of solid wood with a latch on the side and has velvet protectors on the feet. The glass is in very good condition and original. The tapered legs are black finish and angled from the base. Possibly intended for a couple of drinking glasses. original antique 1920s art deco display/drinks cabinet-round fronted-flared club feet-internal ornate mirror backed-good condition-needs one small front pane of glass replacing-dosent include contents !have reduced to lowest price possible now-only selling for downsizing move to bungalow -CASH ON COLLECTION-DONT PAY WITH PAYPAL ! Beautifully looked after antique Dark Oak And glass display cabinet, original lock, small storage draw. Measurement are 2m x 94cm x 46cm total sizes or 79" x 37" x 18"